What if you could combine your favorite things into one pile of awesome? Lots of bands have done this. Cattle Decapitation has combined their love of veganism with modern death metal. How many bands combined their love of music with their love of recreational substance abuse? If you've looked at the album cover, but now you've noticed that it's a bit different than most of the covers featured here. Yes, it's based off of a Gameboy cartridge design....so that means it's what? CHIP ROCK? Well, no, but it's chip metal. 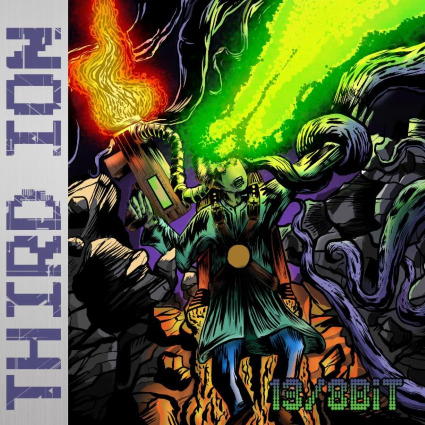 Third Ion, featuring members of The Devin Townsend Band and Into Eternity, have followed in the glorious tradition, not only of nerd music, but chip rock by incorporating sounds from video games into their music. Right away this album is very different than any other metal on the market. 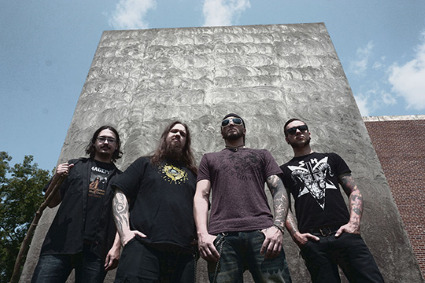 Video game sounds, or chip tunes, play right along with the metal guitars and drums. Many times with spectacular interplay between the two by either playing harmonies or doubling and repeating the computerized music. Without the video game sounds, this would be a great record with its very deftly played rhythms, its bass fills, and other worldly vocals. Add in something new and different and this becomes a monster of an album that is completely unlike anything out there and this coming from a fan of I Fight Dragons. It's not just the video games, but there's also pianos that haunt the tracks and many times lulled me into thinking it was a mellow song right until the metal kicked in and blew the doors off of it. The Chip Tunes give Third Ion a wow factor that even the might Powerglove can't match.